Publisher: Panini, formerly Marvel U.K. Comments: In October 1979 Marvel UK launched Doctor Who Weekly. The license to produce Doctor Who comic strips had been held by Polystyle since 1964, and the character had appeared almost continuously in their titles, starting in TV Comic then jumping to Countdown (later Countdown to TV Action and finally TV Action), then back to TV Comic. However, late in 1979 Polystyle lost the license to Marvel UK, and for the first time the Doctor had a regular title entirely devoted to himself. 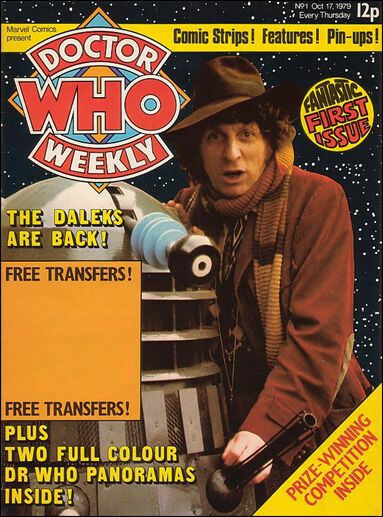 It began life as a weekly title, but switched to monthly production in September 1980 with its 44th issue, when its titled changed to Doctor Who - A Marvel Monthly. The title underwent further minor modifications over the next few years, becoming finally just Doctor Who Magazine as of #107. Each issue has a Doctor Who comic strip (though there have been a couple of issues where the Doctor was absent, and the strip featured someone else from his extensive supporting cast). In addition to the ongoing comic strip, early issues had back-up strips, both reprinting Marvel science fiction tales and providing new stories set in the Doctor Who Universe but not featuring the Doctor. Additionally, some issues have contained short text stories, including an ongoing Brief Encounters series and Prologues for the Virgin Books' Doctor Who novels. Every issue also contains features about the show, which have included news about current productions and releases, interviews with actors, retrospectives on past episodes, previews of upcoming episodes in production and reviews of licensed products. Doctor Who Magazine is now the longest running TV tie-in magazine in the world, with an unbroken publication run of thirty-eight years and counting (October 1979 to date). It even has its own fanzine devoted to it, Vworp Vworp.